American’s are not purists. We abhor specialization. We—almost completely—expand every specialization to a more general use. Small wonder we have pursued the “all-round” hunting dog as if it were the American Holy Grail. Anyone who has tried all three types of sporting dogs—putting them to the widest possible use in American hunting conditions—will tell you that the flushing spaniels come close to being our mythical all-round hunting dog. Most of us start each season in September filling the air around elusive doves with harmless loads of shot. Then we take in the early teal season. Next we switch to the resident upland game birds. We interrupt that occasionally to do a little ducking, until the weather gets too nasty. Then we go back to upland game birds until the season closes. Neither a pointing dog nor a retriever can handle all of this as well as a spaniel can. Spaniels vary in style (animation, eagerness, verve) from breed to breed and from dog to dog within a breed. However, all the good ones have a pleasing way of doing their jobs. I love to watch them bounce this way and that, squirm under this snarl, jump over that one, as they hunt cover for birds. When a spaniel scents a bird, his entire body tells you about it. He becomes more animated, more intense. Some flush “hard: (boldly), diving immediately at the bird with a fly-or-die attitude. Other spaniels have a “soft” or “English” flush. They pause when they scent the bird. Some flash-point and dive in. Others hold point until ordered to flush. The spaniel retrieves shot birds. Naturally, too. The steady spaniel hups (sits) immediately after the flush, marks the fall, and retrieves on command. Clearly, spaniels make better pheasant dogs than either pointing or retriever breeds. I prefer spaniels for Midwestern quail, too. For ruffled grouse, the spaniel’s natural quartering tendency gives him a distinct advantage over the point dog that may pass over large areas of cover, and over the retriever that may be too difficult to keep close. Most of the prairie chicken hunting I’ve done has been similar to duck hunting. Spaniels excel here, too. 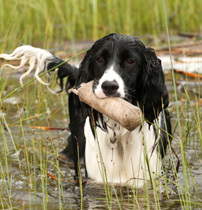 A properly trained spaniel can retrieve doves shot around a pond as well as a retriever. Most spaniels take to water quite well, and they retrieve naturally. During the first part of the duck season, conditions are usually mild enough for a spaniel to retrieve birds shot over decoys, whether from a shore blind or a boat. In a boat, a spaniel has a distinct size advantage over a retriever, as he can slip into the water easily without rocking the boat. When it gets too cold and the ice drives the birds south, it is too cold to use spaniels for shooting ducks over decoys. As even among retrievers, a good goose dog is rare, spaniels aren’t recommended for geese. True, some American Water Spaniels do a passable job, but I wouldn’t recommend using spaniels for the dedicated goose hunter. Condensed from Hup! Training Flushing Spaniels the American Way by James B. Spencer. This entry was posted in Sporting Dogs and tagged description of working spaniel dog, field spaniels, flushing spaniels, how to train a spaniel, James B. Spencer, spaniels, training a field spaniel, training a spaniel, Training Field Spaniels, what spaniels do. Bookmark the permalink.